Baqubah (Aramaic: ܒܰܩܽܘܒܰܐ‎, Arabic: بعقوبة‎; BGN: Ba‘qūbah; also spelled Baquba and Baqouba; its name originates from the Aramaic words "Bet" (house) and "Yaqub" (Jacob) and means "Jacob's house") is the capital of Iraq's Diyala Governorate. The city is located some 50 km (31 mi) to the northeast of Baghdad, on the Diyala River. In 2003 it had an estimated population of some 467,900 people. Baqubah served as a way station between Baghdad and Khorasan on the medieval Silk Road. During the Abbasid Caliphate, it was known for its date and fruit orchards, irrigated by the Nahrawan Canal. Situated on the main road and rail routes between Baghdad and Iran it is a centre of trade for agricultural produce. It is now known as the centre of Iraq's commercial orange groves. The city was used as a refugee camp for Assyrian refugees fleeing the Assyrian Genocide. A refugee camp was set up outside the city, which accommodated between 40,000 and 50,000 refugees. During the course of the U.S.-led occupation of Iraq, Baquba emerged as the scene of some of the heaviest guerrilla activity, along with the Sunni enclaves of Fallujah and Ramadi. It was the site of the heaviest fighting during the June 24, 2004, insurgent offensive. Al-Tawhid Wal-Jihad, led by Abu Musab al-Zarqawi, took responsibility for the attacks. In a setback for insurgents, Iraqi and U.S. officials confirmed on June 8, 2006, that al-Zarqawi had been killed in an airstrike and subsequent raid 8 km (5.0 mi) north of Baquba. 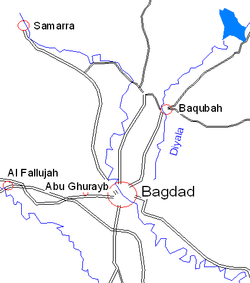 During late 2006, however, Baqubah and much of Diyala province were reported to have come under Sunni insurgent control. On January 3, 2007 the previous Iraqi government in Baquba was reported to have fallen, leaving the city in the hands of insurgents fighting against the American led coalition in Operation Iraqi Freedom. In January 2007, it was reported that Sunni insurgents were able to kidnap the mayor and blow up his office, despite promises from American and Iraqi military officials that the situation in the city was "reassuring and under control". The city at its peak had over 460,000 residents, but a February 2007 report labeled the city a "ghost town" as residents either fled criminal and sectarian violence or remained in hiding at home. The following is a list of deadly attacks in the city including the death of al-Zarqawi and after. April 8–13, 2004: Mahdi Militia attempt to over take the city. American tanks and Bradleys patrol the streets and Artillery and Air Force bombs dropped inside the city limits. June 17–19, 2004: An insurgent element estimated to be roughly 200 personnel strong attempts to disrupt American control of a suburb of Baqubah called Burhiz located approximately 3–5 miles south of Baqubah on the cities eastern side. Elements from 3 BDE / 1 ID including (but not limited to) 2nd and 4th Platoon / A Co / TF 2–2 IN / 3 BDE / 1 ID, 3rd platoon A Co TF 2–63 AR / 3 BDE / 1 ID and TF 1–6 FA / 3 BDE / 1 ID engage enemy forces for approximately three days straight. Fighting peaked during the daylight hours and tapered off to a stop during nighttime. On the second day of fighting (June 18, 2004) an element consisting of 2nd Platoon / A Co / TF 2–2 IN / 3 BDE / 1 ID, 3rd Platoon / A Co / TF 2–63 AR / 3 BDE / 1 ID, and TF 1–6 FA / 3 BDE / 1 ID are credited with killing 26 enemy combatants. The commander of 3 BDE / 1 ID, COL Dana J. H. Pittard alerted the governor of Diyala province that if fighting continued a fourth day (on the 20th of June 2004) that a Brigade-sized operation would be conducted to clear the suburb of Burhiz in a house-to-house fashion (similar in execution but smaller in scope to the later conducted Operation Phantom Fury in which Falujah was cleared of enemy personnel in November 2004). Respective units were alerted and a final draft of the operation had been disseminated to all participants when the fighting stopped. Much of the fighting that took place between the June 17 and 19 could be characterized by lightly armed squad-sized or smaller enemy elements conducting uncoordinated frontal assaults on American strong-points and heavy armored vehicles. The enemy primarily attacked the western side of the American position. Occasional 60mm mortar fire was directed on American forces by insurgent forces, however the effect of the fire was negligible and only served to be harassing as it wasn’t coordinated in any fashion with other enemy assaults. June 24, 2004: Insurgents establish a series of blocking positions and strong points along the major routes of travel through the city prior to 0500 local time. An American Mechanized Infantry Platoon consisting of four Bradley Fighting Vehicles (BFV) and its complement of dismounted Infantry conducting a routine patrol just before sunrise comes under direct fire while passing the first identified enemy position located in the northwest corner of the city. The platoon pushes through the fire and continues south, reaches a second enemy strong point identified vicinity the civic center adjacent to the Mufrak traffic circle where it is fired on again. The platoon continued east towards the bridge spanning the Diyala river located roughly in the center of the city. Upon reaching the eastern side of the city, the platoon comes under fire again from a third enemy strong point located vicinity the stadium and university campus located on the far eastern side of the city. The patrol, after passing through this position, reaches American operated Forward Operating Base (FOB) Gabe. Shortly thereafter, a second patrol launched from FOB Warhorse (located a few miles to the northwest of Baqubah) is launched to assess the viability of the enemy positions. This unit (4th platoon / A Company / TF 2–2 / 3 BDE / 1 ID) led by 1LT Gregory followed the same route as the first patrol that passed through the city and was attacked at the same locations. In response to the operating in semi-permanent defensive positions, the city was effectively divided into two sectors with the Diyala river serving as the dividing point. TF 2–63 AR / 3 BDE / 1 ID was given responsibility to clear enemy personnel on the western side of the city and TF 1–6 FA / 3 BDE / 1 ID was given responsibility to clear the eastern side of the city. Each of the respective battalions launched a company-sized element into their respective sectors. TF 1–6 FA, primarily operating with HMMWVs, received attachments from TF 2–2 IN / 3 BDE / 1 ID and TF 2–63 AR / 3 BDE / 1 ID in the form of a BFV platoon and a Tank Platoon. Prior to 0800 local time two 500 pound bombs were dropped on readily identified enemy positions by the airforce. One bomb was dropped on the stadium located in the eastern side of the city and a second bomb was dropped directly south across the street on an enemy position that was identified in vicinity of a university campus located there. It is believed that a third bomb may have been dropped vicinity of the civic center located on the eastern side of the Mufrak traffic circle. Fighting peaked at about 0900-1000 local time and all skirmishes were over before sunset that evening. A large amount of drug paraphernalia and enemy weapons was recovered at the enemy strong points. November 15, 2004: While US and coalition forces battle insurgents in Fallujah, small cells of insurgents take advantage of the situation and conduct coordinated attacks throughout and around the city after the Ramadan holiday, taking over the Buhriz and Muffrek Police stations and resulting in the dropping of two 500 pound bombs by the US Air Force. Early in the morning, just after sunrise, enemy personnel attempted to destroy one of the two major bridges crossing the Diyala River. On the northern-most bridge bombs were placed on the second and fourth "stringers" supporting the span and detonated. An insufficient amount of explosives was detonated on the bridge and the bridge remained standing (although weakened). Within the matter of a day or two US Army Engineers completed a temporary patch on the bridge which allowed the bridge to safely support the weight of American tanks on its span. Immediately following the blast, American forces were spun up and swept the city, fearing that this was a smaller part of a larger enemy operation attempting to canalize American forces through possible enemy strongpoints in the city center. Such an enemy operation never materialized. June 7, 2006: A U.S. airstrike kills Abu Musab al-Zarqawi, the former leader of Al-Qaeda in Iraq, near Baqubah, northeast of Baghdad. June 26, 2006: At least 25 people are killed in a bicycle bombing in the city, according to police. October 3, 2006: In a string of deadly attacks, gunmen open fire on a Shia family fleeing the city, killing five of them. Ten others are killed in shooting and bombing incidents, and 10 bodies are found in the city, the apparent victims of sectarian slayings. October 26, 2006: Insurgents ambush a police unit, killing 24 policemen and one civilian. Eight insurgents are killed in subsequent fighting with police and U.S. troops, the military says. November 12, 2006: Fifty bodies are found dumped behind the offices of the provincial electric company, according to the Iraqi army's provincial public affairs office. November 29, 2006: Fighting between police and insurgents after an attack on Baqubah's police headquarters shuts down the city, closing the university, schools and most stores, and clearing the streets of everyone, except a few who scurry about to stock up on food. At least 55 militants are killed in clashes in the preceding days, according to anonymous police sources. November 30, 2006: The U.S. military says Iraqi forces find 28 bodies in a mass grave south of Baqubah, following days of heavy fighting that killed scores of people in and around the city. December 2, 2006: U.S. and Iraqi forces begin an offensive in the city in response to fighting that raged for a week between Sunni insurgents and police. Ahmed Fuad, a senior morgue official, said the morgue received 102 bodies in the previous two weeks. December 3, 2006: Some 16 bodies – apparent victims of sectarian death squads – are found. December 29, 2006: Ten bodies showing signs of torture are found dumped on the streets of the city, police and morgue officials say. June 22, 2008: A female suicide bomber detonated a powerful explosive device outside a government outpost and courthouse. 15 were killed in the blast. October 8, 2008: A female suicide bomber detonates at the central court house, killing nine (including five Iraqi soldiers) and wounding 17. October 16, 2008: A mortar attack occurred. Three rockets fired into FOB (Forward operating base) Warhorse from nearby Baqubah kill 2 US Army soldiers, PFC Cody J. Eggleston, and PFC Heath K. Pickard. Both were awarded the Alaska Decoration of Honor. They both were assigned to 1st Platoon, C-CO, 1st Battalion, 5th Infantry Regiment, 1st Brigade Combat Team, 25th Infantry Division, Fort Wainwright, Alaska. March 3, 2010: Suicide attacks killed at least 31 people and injured dozens more in three separate suicide bombings. The third explosion attacked the city's main hospital, where the victims of the first two attacks were being treated. June 14, 2011: A team of six gunmen and suicide bombers dressed in police uniforms attacked Diyala provincial council’s offices in the center of Baqubah. The assault began about 9:20 a.m. with a suicide car bomb attack at the gates of the Diyala provincial council's headquarters. As police officers and Iraq Security Forces (advised by US Army Special Forces) rushed to the scene, other militants attacked a second checkpoint, one detonating a suicide vest and the others spraying guards and civilians with gunfire. Four civilians and three police officers reported killed. Five of the attackers were also killed, and one was captured. On June 19, 2007, U.S. forces launched a large-scale operation against Iraqi militants in Baquba. The offensive, Operation Arrowhead Ripper, involved approximately 10,000 coalition soldiers. Collela, Robert S. (2012). Battle for Baqubah: Killing Our Way Out (revised ed.). Bloomington, IN: iUniverse. ISBN 9781469791067. OCLC 785874729. A 2007 OEF campaign account by a first sergeant of B Company 1-12 Cavalry (Bonecrushers), 1st Cavalry Division, out of Fort Hood, Texas. Text, Videos, and pictures from the front lines and during food distribution. ↑ "Ba'qubah". Global Security. Archived from the original on September 2, 2009. Retrieved 2009-09-14. ↑ Austin, H. H. (2006). The Baqubah Refugee Camp: An Account of Work on Behalf of the Persecuted Assyrian Christians. Georgias Press. Retrieved 2009-09-14. ↑ "U.S. military launches operation against al Qaeda in Iraq". CNN. 19 June 2007. Archived from the original on June 18, 2007. Retrieved 2007-06-19. This page was last modified on 29 January 2015, at 16:30.